Recently Sarasota Bay Watch expanded its Shellfish Restoration Program to include southern hard shell clams. Why? Because these once abundant clams are needed back in the bay. They filter water 24 hours a day, 7 days a week (up to 50 gallons/day/adult clam), so they are excellent at removing excess nutrients, which helps reduce algae blooms. They also remove sediments and make the water clearer, which promotes more sea grass in the bay. These native clams live for 30 years, sequester gobs of carbon in their thick shells, and produce tons of food for other marine life in the bay, thereby supporting our local fisheries. And if that weren’t enough, they eat Red Tide! These clams are remarkably resistant to Red Tide and actually consume the dinoflagellate responsible for toxic blooms and fish kills. If Sarasota Bay were once again full of clams it might help reduce the severity of Red Tides in our waterways. For all of these reasons Sarasota Bay Watch started a souther hard shell clam restoration pilot project in March 2017 with 330,000 baby clams. We have been nurturing and growing them, protecting them from hazards, like Hurricane Irma, to raise them to young adults ready to be released into Sarasota Bay. 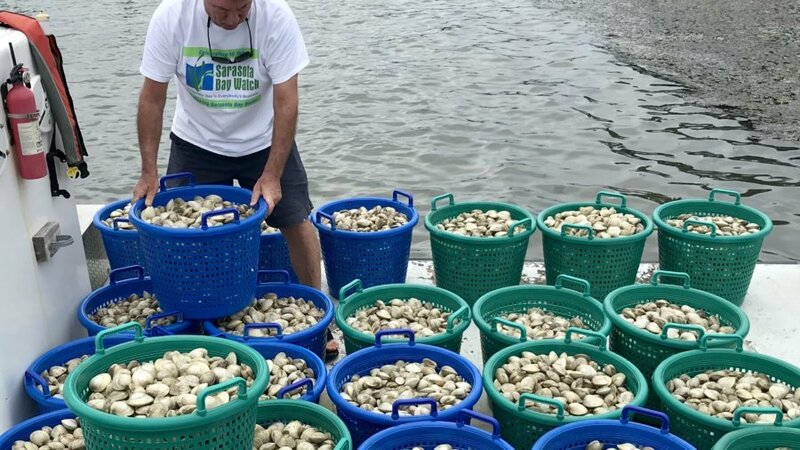 So far Sarasota Bay Watch volunteers have released 125,000 clams with a final goal of about 250,000 by summer’s end. To celebrate this amazing accomplishment and to thank the many volunteers and supporters that made this pilot project possible we are having a SCALLOP SEARCH and CLAM JAM on August 25th, hosted by the Sarasota Sailing Squadron. The morning will be dedicated to our annual Scallop Search – bring your mask, fins and snorkel and help us count scallops across Sarasota Bay. Volunteers can enjoy lunch at the Sailing Squadron and then head back out on the water to designated spots with a couple of bushels of clams that they get to release – it will be a community effort to give these clams a new home in Sarasota Bay! For more information and event registration visit sarasotabaywatch.org.